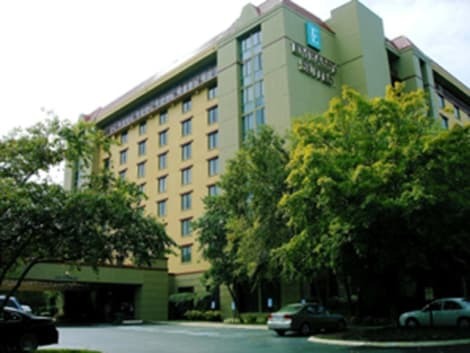 Welcome to the Embassy Suites Nashville - Airport hotel, located five minutes from Nashville International Airport (BNA) and 7 miles from downtown Nashville. Ride our complimentary shuttle to and from the airport, relax in the light, open atrium and unwind with complimentary snacks and beverages at the nightly Evening Reception*.Enjoy all-suites accommodations and more at our Nashville hotelFor a comfortable, convenient stay, select our two-room suites that feature private bedrooms and separate living areas, each with a flat-screen TV. Start the day with our free cooked-to-order breakfast and choose from delicious items such as eggs, signature custom omelets, pancakes, cereal, fruit and pastries. Savor delicious Maryland-style Crab Cakes or in-house Braised Short-Ribs in our Music City Bistro. Stay productive in the 24/7 Embassy BusinessLink™ Business Center, and keep fit when you travel with complimentary access to our Embassy Suites Fitness Center, heated indoor pool, whirlpool and game room.Appreciate our proximity to all that ‘Music City’ has to offerOur hotel is ideal for business or leisure travel. Take advantage of the convenient location that offers easy access to Nashville attractions such as the Grand Ole Opry, Opry Mills Mall, the new Music City Center, and Bridgestone Arena. * Service of alcohol subject to state and local laws. Must be of legal drinking age. Southern hospitality from a welcoming staff is the centerpiece for this music-themed hotel in Music City, a short drive from the new Music City Center convention facility, as well as the Country Music Hall of Fame. 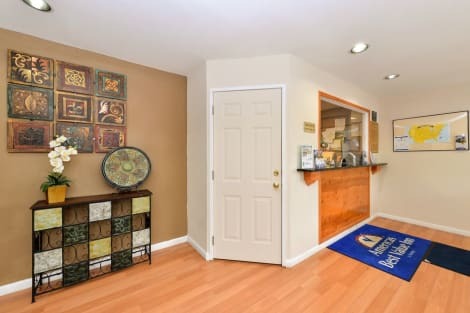 Spacious, nicely appointed accommodations offer wonderful views of the city and the Tennessee hills in the distance; and the hotel provides a health club and complimentary parking. The distinctive décor features classic guitar paintings by Paul Chase, as well as over 400 Hatch Show Prints, which are classic posters, in the guest and public rooms. A variety of shops, restaurants and entertainment venues are nearby in the bustling downtown district. Pralines Restaurant serves regional favorites; and Maxwell’s Lounge is home to live music from local bands throughout the week. 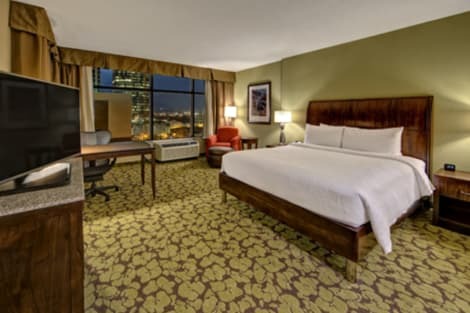 With a stay at Red Roof Inn Nashville - Music City in Nashville, you'll be within a 10-minute drive of Nashville Municipal Auditorium and Nissan Stadium. This hotel is 3.9 mi (6.3 km) from Ryman Auditorium and 4.4 mi (7.1 km) from Music City Center. When you stay at The Alexis Inn & Suites - Nashville Airport in Nashville, you'll be in the business district, within a 15-minute drive of Opry Mills and Grand Ole Opry. This hotel is 6.3 mi (10.1 km) from Music City Center and 6.3 mi (10.1 km) from Johnny Cash Museum. Enjoy a home away from home at Home2 Suites by Hilton™ Nashville-Airport, TN. Whether you're here to experience the famous nightlife and musical history of Nashville, for a graduation at Tennessee State University or on business in the area, our friendly hotel in Nashville offers a great-value experience with a variety of amenities to help you feel right at home.Relax in a modern studio or one-bedroom suite specially designed with thoughtful features such as a full kitchen with dishwasher, microwave and full-size refrigerator. There's space for the family with a sofa-sleeper in the living area and you can even bring your pet too. Keep in touch with complimentary WiFi at the desk with ergonomic chair. Our standard studio suite is one large room and the one-bedroom suite is a little larger, with a wall separating the sleeping area.Enjoy a delicious complimentary continental breakfast at the Inspired Table™ each morning and be sure to try our specialty hot breakfast sandwich. Work while you travel in the 24-hour business center, take in some fresh air with a stroll in around the property on our walking path or splash around with the kids in the heated indoor saline pool. Take an innovative approach to multi-tasking in our Spin2 Cycle Center. This combined laundry/fitness facility lets you keep fit on the treadmill while you run a load of laundry. Meet friends old and new at the Outdoor Fire Pit Lounge and enjoy a fun evening cooking dinner on the outdoor BBQ grills. 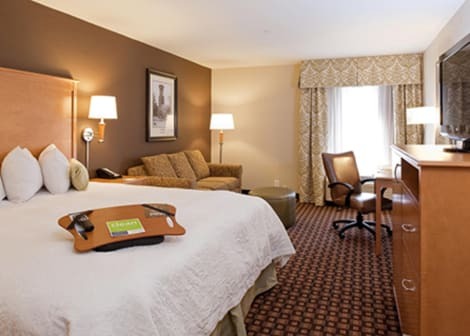 The warm and welcoming Hilton Garden Inn Nashville Downtown/Convention Center hotel features amenities suited for both business and leisure travelers. 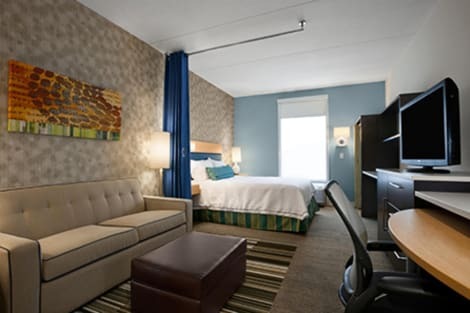 Settle into a comfortable and spacious guest room at this downtown Nashville hotel, equipped with complimentary WiFi, a flat-screen HDTV with premium channels, a plush bed, and a large work desk with ergonomic chair. 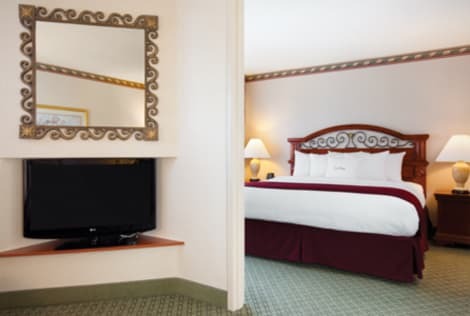 Bright and inviting suites are also available with a separate living space - perfect for families and extended-stays in downtown Nashville, TN.Check emails with complimentary WiFi in all public areas, and print documents securely and remotely to the complimentary 24-hour business center. Plan a successful board meeting, corporate event, wedding or celebration for up to 400 people with over 4,200 sq. ft. divisible meeting space and state-of-the-art A/V equipment.Make the most of your free time at this Garden Inn hotel in downtown Nashville. Exercise with contemporary cardio, resistance and weights equipment in the complimentary 24-hour fitness center, plunge into the outdoor swimming pool, or relax on the sun-soaked pool deck. The 24-hour Pavilion Pantry® stocks all the snacks, sweet treats, chilled meals and travel essentials you’ll need during your stay. Get your day off to the best start with a cooked-to-order breakfast in the Great American Grill, which also serves delicious American cuisine for lunch and dinner. Meet with friends or colleagues to relax with a drink in the bar. The DoubleTree Suites by Hilton Hotel Nashville Airport is two miles from Nashville International Airport and convenient to the attractions of Nashville, Tennessee, also known as ‘Music City.’ With easy access to I-24, I-440, I-40 and I-65, our hotel provides a great gathering place for both leisure and business travelers.Begin your visit with a signature warm chocolate chip cookie. Our hotel lobby welcomes you with soft lighting, country music memorabilia and an open air feel. In your guest room, you’ll appreciate luxurious bedding, a spacious work area, two 37-inch flat-panel TVs and complimentary WiFi. After a good night’s sleep, start your day with breakfast in our casual Bistro Restaurant. Return to the Bistro for dinner to savor classic favorites such as salads, burgers and steaks, along with a cocktail, in a relaxed atmosphere. At the end of the day, burn off some calories in our fitness center, or refresh yourself in our indoor/outdoor pool.Plan an event in any of our five meeting rooms where we have a combined total of 2,600 sq. ft. of meeting and conference space. Expect professional catering service, a 24-hour business center, A/V equipment and complimentary internet access.Experience the music, history and attractions of Nashville, TN, from our DoubleTree Suites by Hilton Hotel Nashville Airport. Our staff welcomes you with hospitality as warm as our signature freshly baked chocolate chip cookie. lastminute.com has a fantastic range of hotels in Nashville, with everything from cheap hotels to luxurious five star accommodation available. We like to live up to our last minute name so remember you can book any one of our excellent Nashville hotels up until midnight and stay the same night.